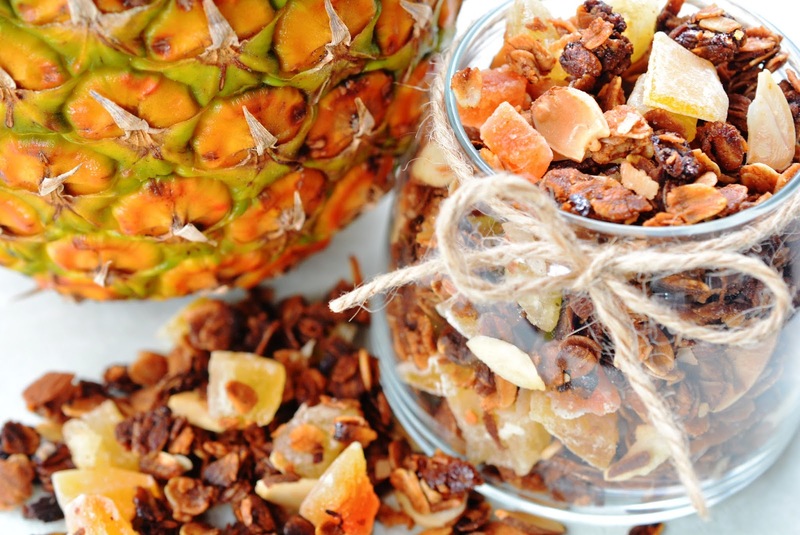 Theresa's Mixed Nuts: Snacking on Tropical Granola this Summer! Snacking on Tropical Granola this Summer! We are so excited that the warm weather is finally here! Once it warms up, we are so ready to get out of the house and enjoy the great outdoors. Beach trips, kayaking, bike riding, or just taking a stroll through the park or neighborhood are some of our favorite warm weather activities. Of course, we always have to pack a few snacks on our outings. If we don't, Allison turns into a total diva (you know, like one of those Snicker's commercial characters. Full. On. Diva Grouch!) I sometimes expect her to turn into Bobby Knight and whip her bike across the park when she's hungry :) Okay, she's not that bad, but packing a snack is usually in everyone's best interest when we are going to be out and about. We like things that are easy to make, nutritious and portable, so I knew that this Tropical Granola recipe was going to be one of our summertime snacking staples this year. Sweetened with honey, cinnamon and dried pieces of tropical fruit, it's really a tasty summer treat. 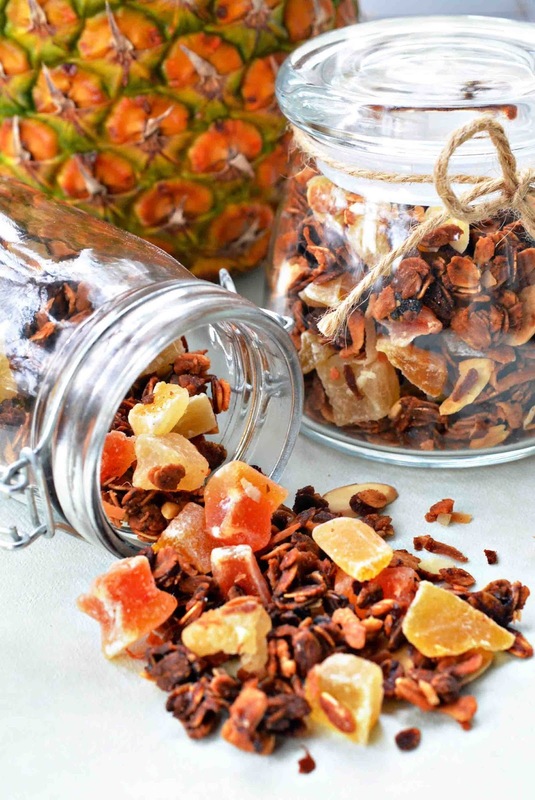 I have a food dehydrator, but was in a hurry on my last batch and found that Sun Maid has little bags of dried mixed tropical fruit that were perfect for whipping up this recipe quickly. Just snip up the pieces with some kitchen shears or slice with a sharp knife and you are all set! What are some of your favorite summertime outing snacks? Never really thought of making my own granola but I love eating it with my Greek yogurt. Thanks for this interesting recipe!! I love it in my Greek yogurt too! Gives it such a lovely texture! I like to use oats in my savoury dishes, really, I do. You know I hate swimming in open water, but I do love to kayak. We thought about taking ours on summer vacation to Florida where the water is a bit clearer so we could gaze at the fishies, but the kids decided on a Canadian vacation this year. Pft! Maybe next year. I'm voting for Canada too! Always wanted to live there! When are we going? There are so many Canadian hunks we need to alert on time. So healthy, I need some more protein with nuts and energy too! Thanks for the ideas on a new mix - making your own is much more fun and personal than buying it ready made! I love granola so much! This looks like a great recipe for it. That looks so good! I love using tropical fruit in any and everything. I can't wait to make this. That sounds so good! I've never made homemade granola before. I think this is the recipe that will change all that! I love how you show me new way to use Honey!! Granola and honey is always a great combo! That is a good one for summer. We like to pack snacks too, but they have to hold up to the heat of the day. I'm guessing this one would do the trick! This looks like a super yummy treat, I love that it is tropical and has granola in it. I am a huge fan of granola! This reminds me of Ambrosia. Yum! I love tropical fruits. I love noshing on healthy snacks like this. I like healthy snacks like this. Great way to eat healthy. Sounds like a tasty recipe! I do love my granola. What a great snack on the go for the summer! Would taste like being on vacation even if at home. My twins love granola! This looks like an easy recipe that will keep everyone happy! This looks so delicious and easy to make. I love to snack on trail mix. I will have to get the ingredients i need to make this recipe. That Golden Blossom Honey looks like something I might just use regularly with my other sweet recipes. But I'm no cook myself and I appreciate the recipe you have here! My family likes the combo of seeds, nuts, and chocolate chips, or peanut butter chips. We also like protein bites. Yes please! This sounds like an awesome snack and I bet my kids would love it.